3-D Monster: CHOCOLATE BEER Served in a CHOCOLATE GLASS?!? YES, PLEASE! CHOCOLATE BEER Served in a CHOCOLATE GLASS?!? YES, PLEASE! 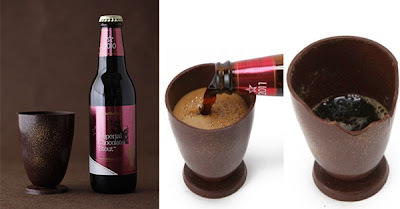 In order to compliment the flavor of their chocolate stout, Japanese brewery Sankt Gallen created a special set that includes a 330 mL bottle of the drink, as well as a completely edible glass that’s made entirely out of chocolate. Rocket News 24 is quick to explain that the chocolate glass might be able to counteract the bitterness of the the ‘ultra-dark beer’, which is apparently brewed ‘with over twice the ingredients of your average dark beer including roasted ‘chocolate malt’.